For years I wasn't a lover of this flavour combination but recently I've developed a love for it. 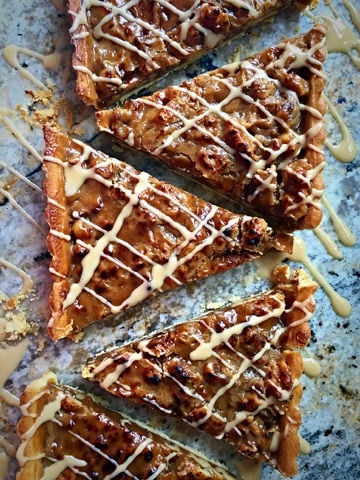 I already have a recipe for Coffee and Walnut Cake so I was thinking a tart would work well. The flavour is fab and the texture is so so good. I was a little on the mean side with my drizzle so use a little more if you like a deeper coffee flavour. If you don't like coffee you can actually leave the espresso out altogether, just be aware the caramel will cook off quicker. Start by making the pastry, Put the flour, butter, sugar and salt into the bowl of a food processor with a metal blade. Whizz using the pulse button until you have a breadcrumb consistency. Add the egg, whizz briefly, then add the water a tbsp at a time, until the dough comes together to form a ball. Turn on to a floured surface and work quickly with your hands until smooth. Wrap in clingfilm and chill for at least 30 minutes before using. Roll the pastry between 2 sheets of parchment, to fit your flan tin, use the bottom sheet of parchment to ease the pastry into the tin. Keep the parchment covering the pastry, fill with baking beans and bake in a preheated oven for 8-10 minutes, remove the parchment and beans, and return to the oven for 5 minutes more. Cool completely. 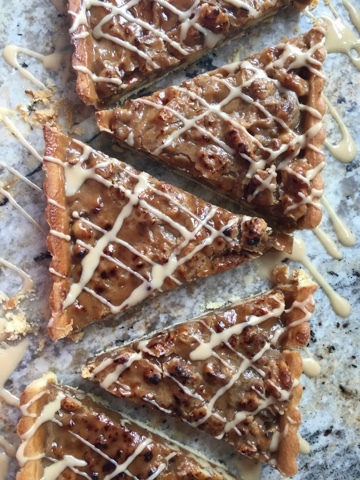 In a large pan heat the butter, Demerara and espresso until everything has melted and is bubbling, continue to cook over a med/high heat for 5 minutes, stirring from time to time so it doesn't catch, add the walnuts, stir and spoon into the cooled pastry case. Bake for 10-12 minutes at 180˚c. 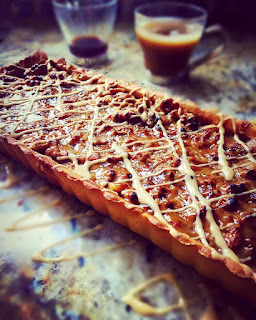 Cool in the tin for 5 minutes before cooling on a wire rack, mix together the espresso with enough icing sugar to make a thickish paste, drizzle over the tart and serve.